I wasnâ€™t really sure what to call these but I guess theyâ€™re like a low carb version of muffins without the bread! 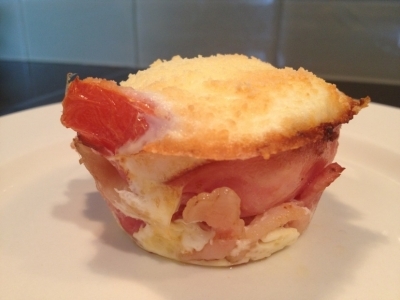 These breakfast cups are made in muffin tins lined with bacon and ham and have tomato and egg inside with a cheesy parmesan crusted top! I was surprised with just how perfectly the flavors came together. You can also make more and store them in the fridge for a breakfast on the go as you start the new year at work again! 7. Remove from oven. let cool, and enjoy!